Naima, the host of the MFM radio! Alright, here we go – our artwork for the biiiiiiiig exhibition in our school is ready! Here, you see the works that focus on nature and environment. Enjoy! Like! Share! Respond! Hello everyone! One of the coolest things here is our arts club. 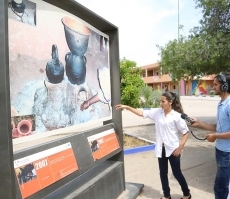 Here, we can develop our talents – and make our school the most beautiful in the whole Maghreb, don’t you think so, too? Our visions for the environment! 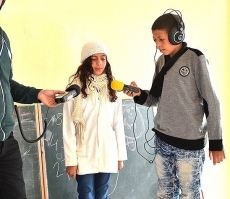 Imagine: Rural radio for kids by kids….! We reach the top of Global Education! 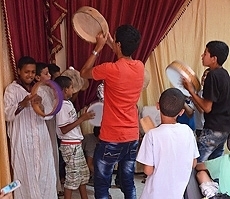 We are the children from Ait Sidi Daoud! The 1st Intercontinental Children’s Musical Poem for Peace! Our 1st Children’s Parliament session on the future! Our 1st Children’s Parliament’s session on Education! Our 1st Children’s Parliament on the future of media! Our 1st Children’s Parliament session on Peace! Our art for childfriendly media – for kids by kids! 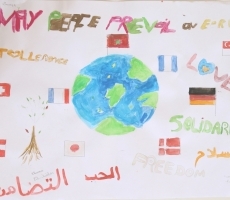 Dear friends,here you find all our artwork for Peace in its final version. The children explain their small drawings! We are the Children from Tamansourt! Merhaba Morocco – here is Berlin! We reach the World Summit ! Taaataaa: We are featured in Global Education Magazine! The Feedback from the Radijojo Ait Ourir crew! Here are our reflections of this wonderful week we had together. 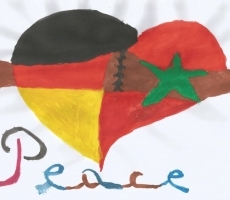 With love from Germany and Kazachstan to Morocco! Africa – Europe – Asia: Three continents, three world regions conncected. 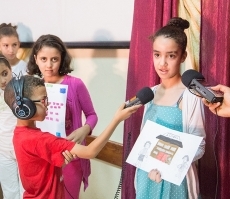 A document of media history – created by us, the children from Morocco, Germany and Kazachstan. Hello everyone, welcome to our 1st children’s parliament session on media! Hello everyone, welcome to our 1st children’s parliament session on education! 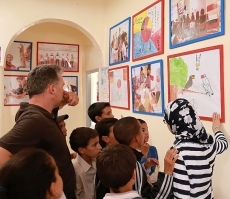 Before it’s time to say goodbye, let’s celebrate our work – and enjoy our art for Peace exhibition! 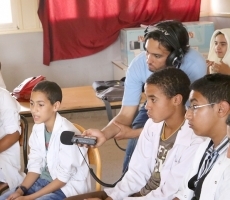 Chair el Hamra rocks the airwaves! Here comes another big point…! Our friend Thomas Röhlinger, the Founder of Radijojo, is appointed as one of the keynote speakers at the Global Education Conference - of one of the best and most important events worldwide for students, teachers, parents, activists. Yeppayeppayeppa! We had a very nice video conference with our new friends in Germany! Peace does not fall from the sky – we have to work for it, everyday. Ahlan wa sahlan, greetings from Morocco! We reach out to Germany: On-air at Radio Blau in Leipzig! Woohoo! 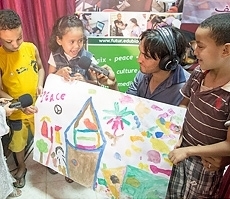 Another fantastic international radio adventure! The radio is in the house! Chair el Hamra is Radijojo’s travelling global newsroom! Hello, Salut, Hallo, Merhaba from Marrakech! Welcome to Lycee Moulay Youssef in Rabat! Merhaba, bienvenue, welcome to our school in the heart of Rabat! Imane: How we want to see our future? 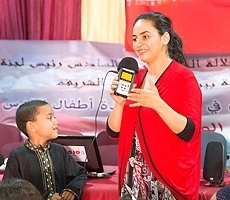 Zineb: Smile – for a better future! Peace is the most important thing in the world. 1st Radijojo Rabat Future Arts Festival! Ladies and gentlemen, dear all, merhaba, bienvenue and welcome the very 1st Radijojo Rabat Future Arts Festival! Dear friends, I would like to share my poem with you. Hello Germany! <-> Hello Morocco! 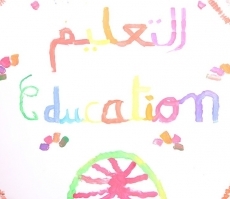 Global Education Conference Declaration – presented by…..us! 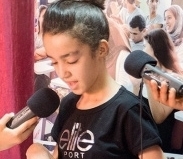 Bonjour, nous sommes des eleves du lycee moulay youssef de rabat-maroc. Nous avons lu la declaration et avons enregistree de vive voix. Amitie du maroc. Dear friends, greetings from Rabat! Hey everyone, come and join us in our workshop! Welcome to Rabat, our UNESCO World Heritage capital! Welcome to our beautiful hometown! Come and join us – we will take you on a walkabout through Rabat, which is part of UNESCO World Heritage since 2012. Hello everyone, the environment was a very important issue in the work of my peers in the workshop. Here is my essay on the future of the environment. It is our contribution to the “world of 7 billion” competition. Our entry is officiallly nominated as one the very best of the world! Hello Berlin! <-> Hallo Tamansourt! Wow, we made it: Our first direct contact to Germany! 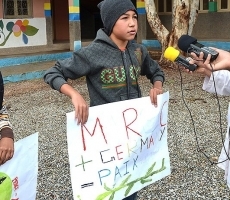 Dear friends, the Children’s are an essential issue – all over the world, and for us here in Morocco, too. Our future art gallery: The “Making of”! You may wonder how we created our wonderful art gallery. Well then, here is the “Making of”! For UN Day: Our future art gallery! Sensational: Our intercontinental videos for the UN! Our intercontinental videos for the UN! Sensational: Our Peace doves from three continents! Welcome to Ouaht Sidi Ibrahim ! We are live on air on MFM Atlas! Ait Ourir Children’s Peace Council: our 1st resolution! We join the global Fête de la Musique! 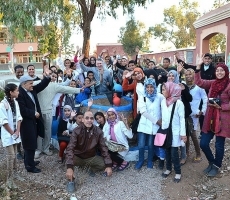 The students of Oued Eddahab college say: Welcome to Essaouira! 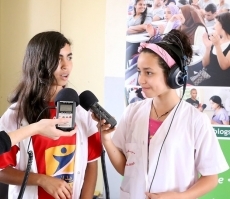 Radijojo at Cadi Ayyad University Marrakech! We rock the house at radio SNRT! 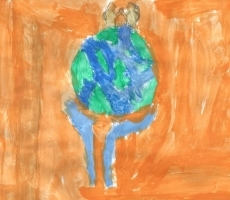 We join the international toddlers arts exchange! Our question for the United Nations! Welcome to the kingdom of Berber music! Come together! 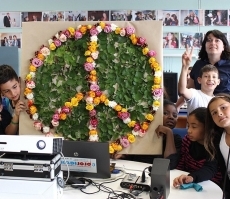 We meet children in Berlin via Skype! Welcome to our Chair El Hamra middle School! Hello Germany <-> hallo Marrokko! 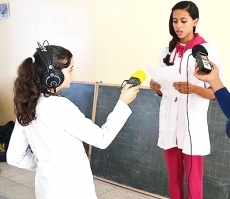 We meet World Summit Youth Award winner Fatima! 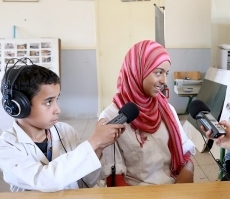 Our school radio joins the Radijojo global network! We fight for the environment – with the United Nations! We surf the airwaves at Radio SNRT! Discover Ourika valley with music! We quizz the decision makers! Yeah! We meet with Berlin kids via skype! Wir sprechen und singen auf Deutsch fuer Euch! 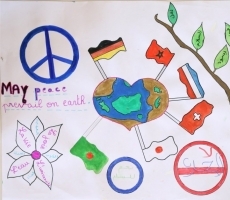 Our Peace gallery for you! 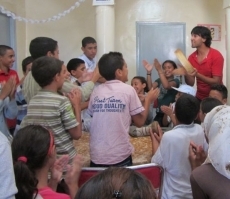 Our children’s rights session with UNICEF! Check out our project logos! 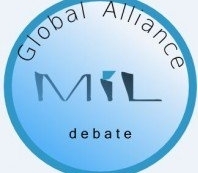 Global Media Forum features our Marrakech project! 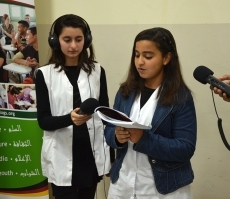 Nous sommes le future du Maroc: Our poem for you! The media secrets – shared by a super profi! Please let me share some of my work with you!